Do you have a horse older than 18 months that you forgot to get registered? Now is your chance to get that registration submitted and save a little money! Throughout the month of April, the MFTHBA will be discounting Stallion, Mare and Gelding registrations. Until April 30, adult stallions can be registered for $100 (regularly $200), mares can be registered for $50 (regularly $100) and gelding can be registered for only $40 (regularly $65). 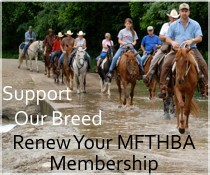 Horses must meet the requirements for registration and owners must be current MFTHBA members. Discounts do not apply to the Missouri Fox Trotting Horse Pony Registry.